Two World Major Marathons finish in these parks: totally different personalities! Sunday is Marathon Day here in New York City. I’ll be along 5th Avenue, under the golden fall foliage, watching about 52,000 runners will themselves through the last three miles through Central Park. It’s such a great day that connects all five of Gotham’s boroughs. On another level, the marathon itself might be perhaps a great metaphor for this city: a multinational event that’s big, expensive, and rooted in competition. This is quite a contrast from the Chicago Marathon’s trademark welcoming vibe. Before I moved to New York, I cut my marathoning teeth on the streets of Chicago, so when I ran NYC I was surprised by the differences. The biggest difference I noticed between the marathons was the way that they were marketed. This got me thinking about what a marathon says about its host city? Read more and weigh in at the bottom! In 2010 and 2011 in Chicago, the Bank of America ad campaigns were all about motivating one another, even printing the chipper slogan, “Let’s Run Together” on the 2011 finisher’s medals. The caption makes it seem like the Chicago Marathon is a race for you and your 45,000 closest friends. Huh. What a difference in perspectives! One is all about togetherness and the other is all about ME! Interesting! This contrast got me thinking about the character of Chicago vs. New York. On the one hand, you have Chicago. Carl Sandberg’s supportive “City of the Big Shoulders” that was home to agriculture and industry mixed with Midwestern humility. On the other hand, New York is the city about which Ol’ Blue Eyes sang, “If I can make it there, I can make it anywhere!” It’s a competitive city that makes you aggressively fight for even the slightest bit of subway standing room. In other words, you have the The Capital of the World vs. The Second City. The city of the team that holds the most World Series titles vs. the city of loyal fans of cursed baseball teams. Neat martinis vs. cans of beer. In fairness, the New York Marathon’s 2010 publicity materials boasted, “I’m in. We’re in,” but it still prioritized the first person pronoun. So does New York’s individualism translate into self-centeredness? Is this ad just a characteristic New York style brag? In your face, other marathons! I could be reading too far into the slick marketing and the catchy phrases. Still, I can’t help but wonder if a city’s marathon reflect that city’s personality. You could argue that cities are made up of individuals, but it still leads to a collective identity. Race courses usually show off the best views of their city, but do a city’s races share the overarching community ethos? Forget the question, “Why do you run marathons?” and instead think about “Why do you run that marathon?” People make choices for all kinds of reasons: proximity to home, a flat course for a new PR, you got in the lottery so you might as well do it. I’m wondering here if there are personality-based reasons why certain races appeal to certain people. Do big races draw more extroverts? Are trail marathoners any more rugged than city slickers? Have you ever participated in a race that seemed perfectly suited for the city? Or do runner attitudes make up for the different feels in races? This is really fascinating! Maybe the big crowds draw ego-maniacs? Maybe introverts like trail races? Hmmm. Thinking about one marathon I am very familiar with, Columbus, their marketing really reflects their RD – they’re all about the community and running for a bigger purpose. It’s awesome. I’m not sure Cbus itself is a very charitable town culturally, but the RD (and his wife, HI CLOVE!) are very much into making this world a better place through their work which is really reflected in their race and the marketing of it. I’ve definitely noticed the difference in marketing strategies for many races. I haven’t run NYC but I have spectated at it. But I have ran Boston and Chicago (focusing on big races for this particular conversation) and can definitely see the differences in each race/cities approach to things. I think the runner attitude can definitely enhance the vibes already coming from the race though. NYC shows the edgy attitude, Chicago the midwest friendliness, and Boston the historical yet semi elitist. The historical appeal of races like Boston is definitely a pull. (Not to mention the supreme brag factor.) I wonder if there are other landmark races that are also “elistist,” or is that appeal also covered by a BQ or OTQ run on any course. I’ve heard great things about the Fargo Marathon! Have you ever done it? Plus, I’d LOVE to run the Twin Cities Marathon. In addition to being a beautiful course/area, it’s where I grew up, so I’m hoping it would be like a triumphant homecoming with an awesome race. 🙂 Grandma’s up in Duluth is supposed to be awesome too. I have not yet attempted a marathon. But Twin Cities is the marathon I would most like to run. I generally prefer nature oriented races over urban races. It seems like Twin Cities is an urban race with great natural beauty. My local race, the Indianapolis Monument Marathon, has a good reputation, just in case I don’t want to travel for my first 26.2. I agree with honey! Do Indy! It is a GIFT to be able to sleep in your own bed the night before a race. Sign up, I dare ya! Give yourself an out if you want, but since you don’t have to make travel plans I bet once you sign up, you’ll pick a training plan and the rest will just fall into place. Take it from someone about to run my home race for the first time – it’s a luxury to just let the momentum carry you! On the other hand, when you travel you make firm plans and that can push you over the hump from signup to follow-through. YESSSSS to sleeping in your own bed the night before a race!! Fargo marathon is AWESOME. I live in Fargo/Moorhead and it’s a huge event every year. I’ve only done the full marathon here once, but I’ve run the half 4 times. The entire course is filled with spectators, there are bands playing all along the course, and it is COMPLETELY flat. And Twin Cities Marathon is beyond amazing. It was my very first marathon and I haven’t been able to run it again yet (I registered for it two more times but had to quit training two years in a row due to injuries). I think my next full marathon will either be Grandma’s (because I haven’t run it) or TCM again. Also, where in MN are you from? Cool! I’m from the Twin Cities originally. 🙂 If you ever make it to Fargo/Moorhead you’ll have to let me know! New York Road Runners, as you and I well know, has in the last few years been on its knees pandering to Millenials, begging them to come run (and, in my opinion, alienating other groups – for instance, I’d like to see some people of color in their ads, since, you know, NYC is 65% not white). Since only 18% of lottery applicants get in (thanks in part to guaranteed entries given to corporations! 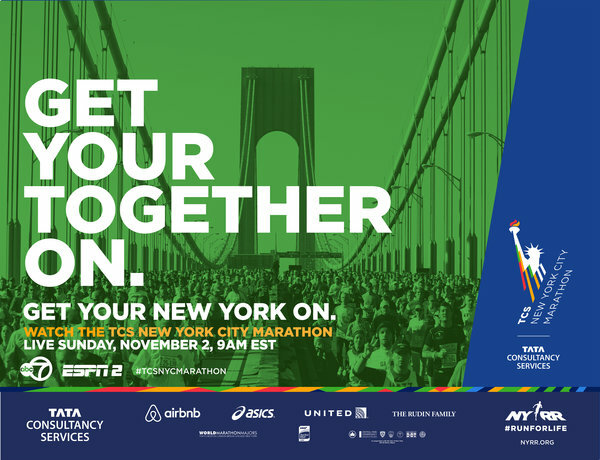 a la your recent post), my guess is that an ad for the NYC Marathon is ACTUALLY an ad for NYRR’s other races – an attempt to increase overall membership in NYRR and get folks working on their 9+1 entry and to get people excited about running in general. I’d be interested in looking at NYC Marathon ads from 2004 – the year before Mary Wittenberg took over as CEO. By extension (and I know I’m starting to ramble, so I’ll wrap it up), I now think an ad for Chicago is an ad for Chicago’s other races too. These ads tend to run around the time of the race, which gets people really excited about running, which gets people to the Turkey Trots and Jingle Bell Jogs and New Year Dashes. And it also gets people to volunteer! And to cheer! And we need that too. Awwww, see? They do get it too! Interesting point on the 9+1 recruitment strategy. Although I think the only other large-scale marketing campaign in NYC is for the half marathon in March. I could be wrong. But also, there are other groups that sponsor runs (NYCRuns among them), so thinking only of the marathon or other NYRR races might make people overlook the other “community” races here that have a different character. Interesting post- I’d never really thought about how the marketing of a race differs from city to city. . . My hometown race, the Eugene Marathon’s slogan is “Running In the Footsteps of Legends” as a nod to Steve Prefontaine, the birthplace of NIke, etc. Eugene calls itself “Tracktown, USA” and continues to really define itself as such by reminding you of the running history we have here- the race finishes on the track of historic Hayward Field. No doubt how a race would want to celebrate the history of the location. In fact, people will demand it, like the fallout from the change in the Rock n’ Roll Half in Cleveland course so that it didn’t even pass by the Rock and Roll Hall of Fame. I’m not sure what ended up happening, but participants were ticked since that did not represent the event or the city.